Like most good things, it was well worth waiting for. Matt Derbyshire’s first goal in open play for Rotherham United had been 17 games in the making. And when it finally came it nearly lifted the roof off AESSEAL New York Stadium. The striker broke forward against Bolton Wanderers on Tuesday night, calmly assessed his options and then crashed an unstoppable 20-yard shot with his ‘wrong’ left foot past Andy Lonergan in the Trotters’ goal. Evans, who normally informs his players of the starting line-up only an hour before kick-off, broke with tradition in the case of the forward whose only previous Rotherham goal had been a penalty against Fleetwood back in August in the Capital One Cup. The stunning strike brought joy and relief in equal measure for the New York Stadium faithful who chanted “Super Matt” and gave Derbyshire a standing ovation when he was substituted late on. The goal and the confidence boost it will give the 28-year-old frontman might just ease the need for Evans to sign a proven scorer. Often through his illustrious career Derbyshire’s goals have come in spurts and who’s to say he won’t go on a prolific little run now? He ran the Brentford defence ragged two and a half weeks ago and his partnership with new boy Conor Sammon - another scorer on a memorable night - was too much for Bolton to handle. “I thought the front two were exceptional,” said Evans. 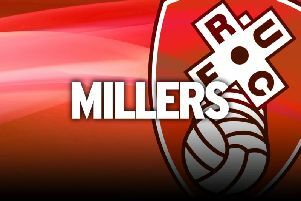 Sammon, who impressed in only his second game for the Millers, said of his strike partner’s effort: “It was an absolutely cracking goal. “We struck up a good understanding and I think we can play well together. Matt’s got good experience, and both of us like to run in from behind. We’re judged on goals and I hope we can be a big goal threat. Bolton manager Neil Lennon, who had kicked a water bottle in anger during the match, was gracious enough afterwards to admit Rotherham had deserved their victory. It was the first time this season the Millers have scored four goals in a game. Not only did the win give their hopes of Championship football next season a huge boost, it was also a matter of personal pride for ardent Celtic fan Evans. Lennon was once manager of the Glasgow giants and is revered by the Rotherham boss. “Neil Lennon is God to Steve Evans,” said Sammon.